Dr. Bourg explores the problem of diversity in tech, specifically in a library context. She investigated similar ground that Junot Diaz, whom she references in the keynote, did at ALA Midwinter. Within a few weeks of Dr. Bourg’s keynote, conservative and anti-PC forces, sought out and harassed her online in many environments. Like most reactionary responses to anything happening in the field of higher education and “political correctness” the responses narrowed in on a specific grievance rather than deal with the entire keynote on diversity in tech. This narrowing focused on a citation Dr. Bourg used to talk about the way in which white guy nerd cultural artifacts discourage women and minorities from staying in tech jobs. I will not link to these posts or these comments because they do not warrant being repeated. It is not surprising at all that some who describes themselves as “butch, lesbian, and feminist” would be the target of sustained harassment. Our culture, especially in the right wing blogosphere and opinion engine, thrives on cutting queer folks down for speaking out against the dominant forces of oppression within our institutions. It also isn’t surprising that publications like The National Review who have found enemies in higher education wouldn’t decline an opportunity to attack the director of one of our best and brightest centers of critical thinking and education. Glancing at The National Review writer’s oeuvre we find all sorts of faults with feminism and gender inclusion in schools, universities, healthcare, yoga, Doritos, and dating apps. What is surprising and disappointing, given the supposed political inclination of our field, is the response that the keynote saw in our online forums run by and contributed to by Librarians. While it is true that many organizations, Code4Lib and ARL included, came out in support of Dr. Bourg, underneath these organization lies a dark and toxic quagmire of reactionary attacks and harassment. Many of these toxic social media collectives are well known to us, and the example of Dr. Bourg’s treatment made me think about libraries, social media, and attacks against social justice efforts. The group formerly known as ALA Think Tank is one such example and the twitter bot LIS Grievances is another. On Think Tank, A user shared a conservative anti-higher education blog post from the College Fix about Dr. Bourg and commented that “This librarian claims to want to non-gender our workspaces but totally genders our likes and dislikes in the attempt!” Which led to dozens of shares and comments some in support, but most in the dog pile against Dr. Bourg. Important in this post by a fellow librarian, and the conservative blogger, is the fact that Dr. Bourg’s butch appearance is threatening to masculine and cis spaces in general, as if her appearance or her sexuality preclude her from discussions on gender in workplaces. The problem here is not that anyone is not able to disagree about the gendered nature of Star Trek posters (Dr. Bourg is quick to point out that these are stereotypes of male dominated tech spaces), but that our supposedly inclusive profession, one where discussions about Nazis in libraries prompt long winded think pieces about neutrality and librarianship, attacks our own members with gendered, disgusting, and unthoughtful volleys. Much like the attacks against feminists during #gamergate, reactionary forces use the shield of geek culture to allow themselves the room to attack women with impunity. This explosive reaction was from one line in a 45 minute keynote address, and yet dominated library discussions and led to threats against Bourg’s institution and herself. On the other hand we have @LIS_Grievances. This is a bot programed to tweet “grievances” with the field with an appropriate profile image of George Constanza (although Frank was much more of the grievance type). When a disgruntled member of our field submits a “grievance” it comes out of the bot’s mouth. Recently these have been only slightly veiled attacks against prominent critical librarians on twitter. Commenting on “self-righteousness,” “blowhards,” and the long-time scourge of the academic library….critical theory. 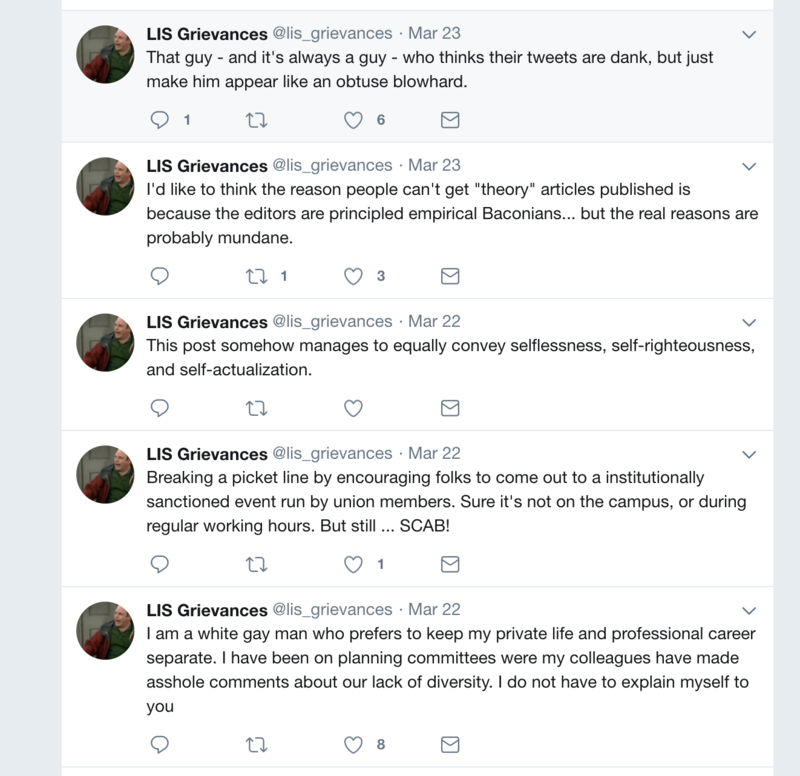 Groups like Think Tank and @LIS_Grievances perpetuate the outrage machine that feeds many library focused online harassment moments. More specifically, these two social media engines work to undermine the work done by our colleagues who think critically or imagine the library role as a social justice issue. When they attack, they attack specifically those who are marginalized or work for the marginalized. The toxicity of these is an open secret amongst many librarians. This prompted Hiring Librarians forum on whether or not librarians would hire someone who posted on Think Tank https://hiringlibrarians.com/2014/01/03/further-questions-does-participation-in-the-alathink-tank-facebook-group-hurt-a-candidates-chances/. Should involvement in ALA Think Tank hurt someone’s chances at getting a job? Not automatically, but after these repeated attacks against minorities it should make us all think about what a membership to such a community might be like. Woodworth challenges the notion that its open format is truly open. Not only does this include time to be involved, the controversies and the fights, even when tame, exclude many members of our library world. This is not a welcoming environment. The example of Dr. Bourg’s harassment is just one, of many, examples. (Here is a Library Microaggressions post referencing the not-too-uncommon Think Tank http://lismicroaggressions.tumblr.com/post/98411107398/from-an-ala-think-tank-thread-on-racism). Woodworth does not go as far as to throw ALA Think Tank out completely because of its problems, but maybe it is time. The attacks from Think Tank or @LIS_Grievances are not the community at its most rabid, but it is the tip of a larger toxic iceberg. These call out social medias thrive on the dog pile. They thrive on not being kind to others in our profession and we as a profession need to seriously think about how we support our fellow librarians, even if we disagree with them. As librarians take the lead on neutrality and freedom of speech, we should also take a leading role in the development of digital empathy, especially for those who practice social justice. Psychologists have called society’s uncontrollable rage toward one another online as a symptom of “online disinhibition.” (Konrath, O’Brien, Hsing 2011) The mediated, online, and asynchronous environment does not discourage verbal abuse levied at other “faceless” folks online. Fostering digital empathy could be a step forward in troubled times. Christopher Terry and Jeff Cain wrote in “The Emerging Issue of Digital Empathy” that digital empathy shows “a targeted awareness that digital communication is powerful and can often have unintended effects on others.” (Terry and Cain, 2016) While this idea could be ripe for academic librarian instruction, especially for younger students, it will be essential that we instill these beliefs in our own interactions online. While it is easier to paint conservative bloggers with broad brush strokes about their anti-PC fights, it is more difficult to understand the dog pile when it comes from librarians. We should be aware that all of our spaces online are not inclusive or even safe. We are a social justice field, we should fight against those who would malign our “woke” colleagues.